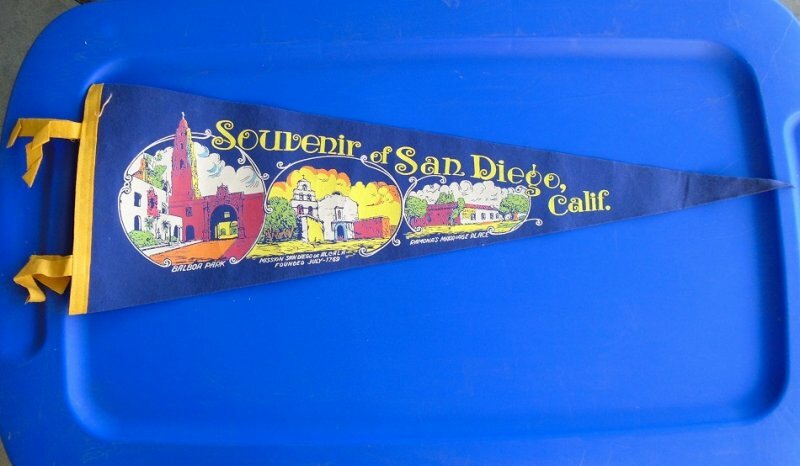 San Diego California Souvenir banner, pennant, flag. Balboa Park, Mission San Diego de Alcala, and Ramona's Marriage Place. 1950s to 1960s time frame. This listing is for the 'Souvenir of San Diego Calif" banner you see in my photo. It shows Balboa Park, Mission San Diego de Alcala, and Ramona's Marriage Place. All 3 of those locations were very famous San Diego attractions. The banner is not dated and since I purchased it at an estate sale, there was no one to ask about its age. I decided to research Ramona's Marriage Place to see if it is still in business and if not, what year did it close. Wikipedia has a statement that says it was sold in 1964 "to the Title Insurance and Trust Company, which then sold it to local businessman Legler Benbough, who donated it to the State of California in 1968". Going by that statement I'm guessing that this banner would be from the 1950s to 1960s time frame. It measures 27 inches from the wide left side to the point on the right side. The left side measures 8.5 inches from top to bottom. It is made of a felt type of cloth material. You'll notice in my photo that in the upper left edge area there is a yellow thread. I had decided to leave that and not pull it off and possibly damage the banner, but when I touched it, it was actually just a thread and not attached to anything. So, that thread is no longer there. In my opinion, this banner is in wonderful condition. There are no tears, and no fading. Holding it up to a light I can see one tack hold in the upper left corner, but without holding it to the light I cannot see it.